Around Thanksgiving, many of us pause to reflect on the things, people, and circumstances that make us grateful. Some families even have traditions of sharing gratitude around the Thanksgiving table. Recent research, however, might make you want to extend those practices of gratitude beyond the Thanksgiving holiday—and into your classroom. As more and more research demonstrates the positive impact that gratitude can have on one's mental and physical health, many teachers and educators are building gratitude-focused activities and routines into their classroom. When students reflect on, share, and document their gratitude, they develop the improved physical and mental health and enhanced social and emotional skills that giving thanks can bring. The Positive Psychology Program has a robust collection of gratitude exercises that can easily be implemented in the classroom. For example, students can write and deliver a "gratitude letter" telling someone what they have done that makes them grateful. The BetterLesson Lab has a Gratitude Sharing & Reflecting teaching strategy with a variety of tips and resources to build gratitude into your classroom. One strategy that works particularly well for preschool students is introducing the concept of "bucket fillers" and helping students recognize when a peer has "filled their bucket." Consider having students write weekly entries in a gratitude journal in which they write their own reflections or lists. In some cases, these gratitude journals may be shared with the class, but in many cases they serve as a private moment for reflection and contemplation. If you think students would benefit from a more robust series of lessons on gratitude, consider using the Gratitude Lesson plans from the Greater Good Science Center. Their curricula, designed for both K-8th grade students and high school students, works great either in a content classroom or in a setting like advisory or homeroom. If you're looking for an easy-to-implement, high-impact strategy to try tomorrow, see how BetterLesson Master Teacher Stephen Pham engages students in a "Closing Shout-Outs" activity at the end of each class period as students recognize one another for embodying core values. 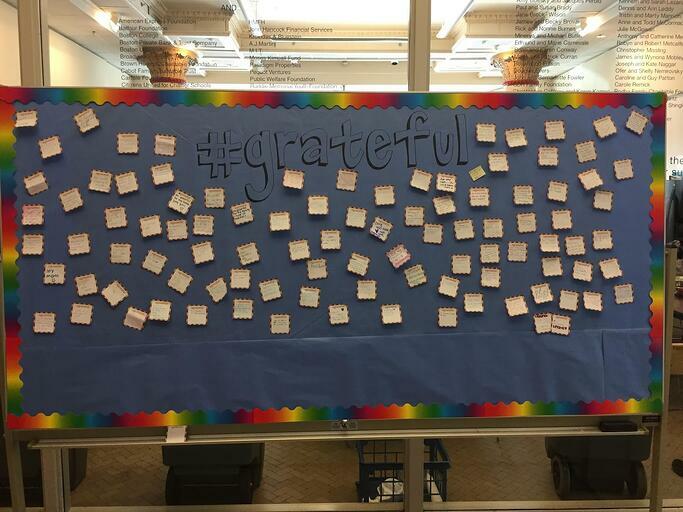 For a more visual representation of gratitude in your classroom, consider creating a "kindness wall" where students can publicly post messages of gratitude. 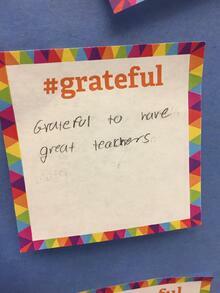 Students can use post-its to add their messages of gratitude to the display for all to see. Gratitude isn't just for students; it can also be a great tool for school leaders to use with staff. If you're leading a professional development session or staff meeting, consider giving participants three minutes at the start of the session to jot a note of gratitude to a colleague on a post-it and hand-deliver it. Alternatively, keep a stack of notecards in your desk and take time each week to jot a short note to a teacher and drop it on their desk or in their mailbox so that they know you're grateful for their work. Incorporating gratitude into your classroom culture doesn’t have to be complicated. Whatever way you choose to implement them, the simple acts of acknowledgement and thanks have profound benefits that kids will carry with them wherever they go.